The breeding season is in full swing at the Stanley Park heron colony. 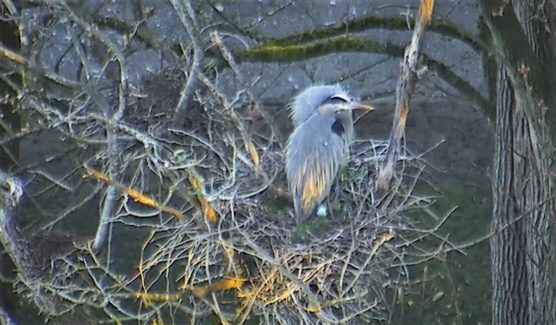 Most of the herons are paired up and laying and incubating eggs. With so many active nests with eggs (79 to date! ), bald eagles are making regular appearances in the colony. Eagles are a natural predator of heron eggs and young chicks. In what seems ironic at first, most large, successful heron colonies have an eagle nest within them. It seems strange to nest with your predator, but there is an advantage. Eagles are territorial, and one nesting pair will keep other eagles away. Unfortunately, the Stanley Park heron colony does not have nesting eagles near enough to offer protection, so it is likely many different eagles are exploiting the eggs. Stanley Park Ecology Society continues to monitor the herons. We also monitor the nesting eagle population in the Park. Over the past decade, the total number of eagle nests – along with the number of active eagle nests – has increased. As a former endangered species themselves, we are pleased to see such a strong recovery of bald eagles returning to the Park. We will keep our fingers crossed that the eagles find a different food source so the herons can incubate their eggs and raise their chicks. In the meantime, you can view all the action on the Park Board Heron Cam, or come down and view the colony in person! This year, SPES is providing live interpretation at the colony every week. Like us on facebook to find out when! We’ll see you there.